Love to climb? Love to turn? Global Motion™ brings it all together. This patent-pending freestanding rotating climber packs in plenty of fun—climbing, turning, running, gathering and socializing. Kids of all abilities will appreciate this energetic ride. You'll appreciate its built-in progressive resistance mechanism and proprietary technology that ensures Global Motion maintains a reasonable maximum speed. So you can focus on the fun! Bring a whole realm of activity to your playground. Design, manufacture and install children's play structures, climbing walls, athletic gymnastic pads and mats, soft toddler play areas and more. Boost membership and retention by attracting families with children. The addition of a play structure at your club allows participation by the whole family. Many recreation centers now look after children while parents work out. International Play Company's products fit any space and budget. Have you fallen into the post-and-platform rut? Revolutionize your playground with a towering central structure inspired by nature. Branch Out™ functions as both an aesthetic focal point and strong, integrated link to traditional components. Its scale and open layout promote multidirectional play flow and provide maximum play value. Staying true to its roots, this structure can be "branched out" in a variety of ways—making it perfect for playgrounds that plan to grow. Superior Recreational Products introduces its newest climbers. Climbing Boulders, available in four sizes for children ages 2 to 12, look and feel like real rock and allow children to explore their physical and cognitive capabilities. Available in four colors, these nature-inspired climbers have organic pigments throughout their surface, ensuring the boulder will never need to be touched up if scratched or chipped. Climbing Boulders will make a great addition to any playground. American Swing Products Inc. was started in 1986. The company is located in Reno, Nev., but sells nationally as well as internationally. Shipping is free in the continental United States. 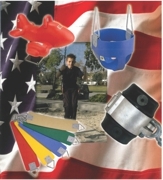 American Swing's products are new and innovative. The company is always redesigning its products to include the latest technology to increase longevity and safety. Work with Bears Playgrounds to design your own, custom, nature-inspired cedar log playground. Choose your parts and layout. 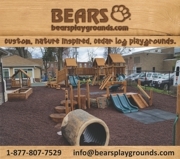 Bears Playgrounds has created a "hybrid" or balance between the innocent, natural adventure of playing in the forest and the structure and safety required by today's standards for children's spaces. Bears Playgrounds' mission is inspired and focused: "to create fantastic, nature-inspired products which enhance children's environments." It's a climber. It's a spinner. It's a new spin on climbing! The REV8 is a rotating climber that takes the Merry-Go-Round to a whole new level. Users can push, spin, sit or climb on one of eight climbers while having so much fun they won't realize they are honing important skills. Inspired by the excitement and speed of ziplines and roller coasters, Miracle brings the "thrill' back to play with the new Gravity Rail. Gravity Rail lets kids safely cruise through the air, over dips and around curves—no harness required. Unlike other track rides, the Gravity Rail leads the industry by working in both directions to provide a round-trip zip, so the thrill never ends.